The first ski lift in the United States was a rope tow in Woodstock, Vermont. 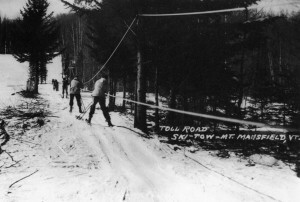 That rope tow began operation in January 1934. 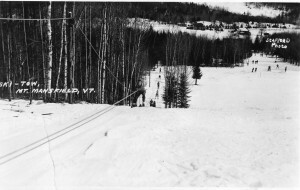 Over the following few years, rope tows would spring up on hills throughout Vermont. For the 1935-36 season, Wesley Pope of Jeffersonville decided to get in on the action. He built a rope tow on the Glenn Skiff farm which was located between Cambridge and Jeffersonville, just off what is now Route 15. The rope tow would not stay stored for too long. Craig Burt came over from Stowe and offered to buy the tow and associated equipment. They settled on a price of $900. Pope with help from Craig Burt installed the 1000-foot tow on the Toll House slopes during the autumn of 1936. Pope recalls that they finished the installation in December just before Sepp Ruschp’s arrival in Stowe. Mike Leach had the correct answer that Stowe’s first rope tow actually came over the mountain from Jeffersonville. 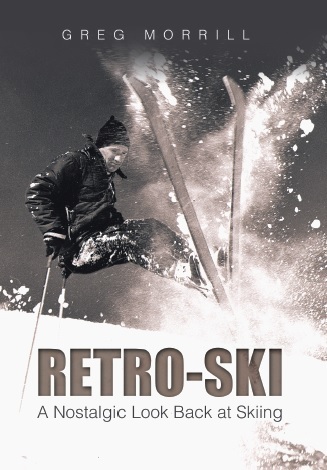 Mike, who is the historian for the Mount Mansfield Ski Club, referenced Pat Haslam’s “Ski Pioneers of Stowe, Vermont” which provided the details on that first lift on Mount Mansfield. The tow was powered by a 1927 Cadillac engine as John Thurgood indicated last week. Craig Burt had been instrumental in getting Stowe on the map for skiing prior to lifts. For the 1935-36 season, the Toll House opened for the first time in winter with a guest house, snack bar, and sports shop. For the following season, Burt and the Mount Mansfield Ski Club arranged for Sepp Ruschp to come to Stowe from Austria and teach skiing. Burt obviously saw that adding a lift would make the economic opportunities even greater, so he arranged with Wesley Pope to build that first tow. Snow was still a problem during that winter of 1936-37 since the tow did not actually begin operation until February 7, 1937. That date marks the beginning of lift-served skiing on Mount Mansfield. One ride on the rope tow would cost you ten cents. A full day ticket was a dollar and a season’s pass was five dollars! To put that in perspective, a quick math exercise says the season pass would be equivalent to about $150 today. OK, so you get more lifts, longer lifts, and faster lifts for your pass today. Next time you’re riding up the Quad or Gondola, remember it all began 80 years ago with a basic rope tow. By the way, Stowe Mountain Resort Vice President of Marketing, Mike Colburn, actually has a length of rope from that first tow in his office. If all this talk of rope tows has some of you RetroSkiers nostalgic for the “rope tow experience”, there are definitely still some areas with rope tows. Granted, most of them are small areas, but the rope tow is still a part of lift-served skiing. 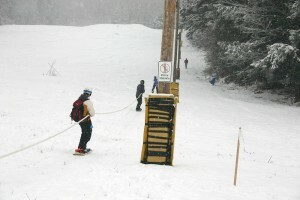 At Ascutney you can even ride the tow for free! As you may remember, the full-blown Ascutney ski area closed in 2010. When the resort land went on the market, the town of West Windsor voted in 2014 to purchase the land and add it to their town forest. A non-profit, Mount Ascutney Outdoors, formed to promote and protect the recreational opportunities of the Mount Ascutney land. Last season Ascutney Outdoors constructed an 800-foot rope tow and lift-served skiing returned to Mount Ascutney! The rope tow reopened a week ago and again this season, tickets are free! They do require tickets for liability reasons, but there is no charge. By the way, backcountry skiing on the rest of the former ski area is also encouraged.